Q – What style or design of Modular Kitchen are commonly used? A – Modular Kitchen comes in 3 basic styles C-shape style , L-shape style and Parallel style. You cab also go for U-shaped style or Island style Modular kitchen. These two styles are ideal for those who work and cook in most leisurely way and have spacious work-space. We then look for the position of sink, cooking area and refrigerator, if they complementing each other or not, as the positions of these 3 components helps make the kitchen an efficient work space. Q- What is the material used for cabinets for Modular Kitchens? Are they user friendly? A – You need not worry about the material used for Modular Kitchen as they are user friendly which are water resistant, heat resistant. You will get different materials from natural or lacquered wood, combinations of wood and laminate, laminate and granite, or even aluminum and marble for the cabinets. You can get the cabinets custom made as per your style and choice of material, but its needs to be appropirate for kitchen use. Marine ply is a good cabinet material because of it”s resistance to water. You”ll get matt finished and gloss finished in Marine ply. Either of them can be used as both are equally good. It is quite an economical material. Solid wood cabinets need a lot of care and frequent polishing to retain the lustre. Constant water contact causes solid wood to rot. Firstly, because it gets heated up easily which will make you uncomfortable while cooking and secondly cause they are prone to rusting if not powder coated. Q- While working in kitchen, there is lot of rough handling of drawers and many a times drawers either get stuck or are difficult to open/close easily, also the edges are quite sharp which hurt. So, I would like to know if its the same with Modular kitchen drawers? 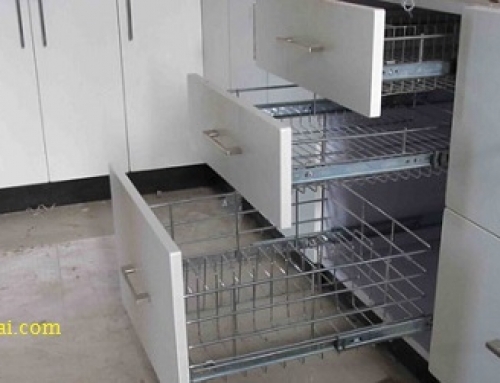 Q – And what are different hardware used while making cabinets and drawers for Modular Kitchens? A – You have many different materials used like, Telescopic channels are most commonly used. They allow the drawer to open fully so you don”t have to struggle when you need a jar which is at the back of the cabinet. You also get hydraulic hinges that allows smooth and easy opening shutters. You get to choose from a 90 degree hinge or a 165 degree hinge. 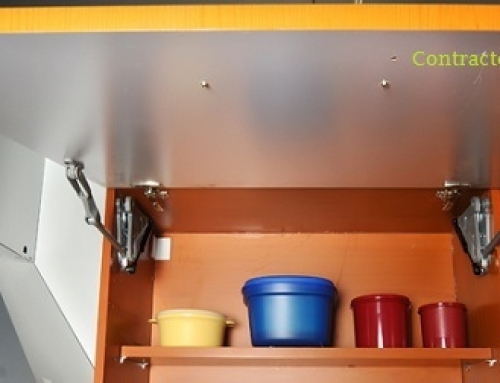 90 degree hinges are used for regular cabinets while 165 degree hinges are ideal for corner cabinets under L- shaped platforms.They make cabinets with folding doors easier to open and access. Smooves-a type of hinge has a similar mechanism but are of a higher quality. They are very expensive but worth every penny. Grass channels close at feather touch but never bang shut. So you won”t have to worry for it rough handling. I suggest you to avoid bottom-mounted channels, as the drawers with such channels do not open fully. At least 4 to 6 inches of the drawer remains inside. Storage – It’s always a good idea to store your detergents or chemicals used for washing utensils and kitchen here. Avoid have food and utensil storage here. Infact I would say that it’s a big NO. Reason, there are chances for cockroaches and other insects to live. Its best to have dustbins, detergents or utensils related other sops, scrubbers, etc. here. Below sink Cabinet Hinges –There are Chances that the door hinges below sink area will get wet. We therefore suggest you to have SS (stainless steel) hinges installed to this particular area. 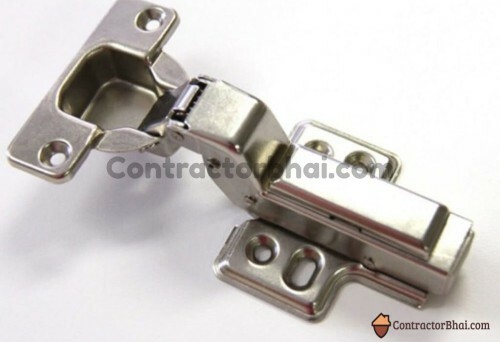 Not all hinges are stainless steel which rust soon and thus need to be constantly changes or repaired. SS hinges are somewhat expensive than other non-durable hinges. But it’s all about quality. And you need just 4 hinges, 2 on each side for under sink cabinet door. Magic Corner – Say the counter-top is in L-shaped. You have this corner joint there. We recommended home owners to avoid picking much expensive fittings for this corner area. There’s a reason for it. We have noticed that home owners eventually stop using this corner much because of its difficult corner access. Well here’s a Value for money tip for you. Store heavy or not often required item there, say which you may require once in a month or once in two month. For e.g. many home owns have spare cylinder which can be placed in this magic corner. Rather than undergoing this headache, we would suggest you to opt for Parallel style kitchen than L-shaped kitchen if room allows. Parallel style kitchen is the best Kitchen style of using every inch of space. Q – Apparently,what is more popular Fully-Modular Kitchen or Semi-Modular Kitchen According to you in India? A – You will get to see more of Semi-Modular Kitchens then Fully-Modular ones in India. The look of each of them is more or less similar. Q – In that case, when I enter a store or any kitchen what helps me identify if its a Semi-Modular and Fully-Modular kitchen? A – That is very easy. You shall notice the base of the structure for that. In Fully-Modular Kitchen the entire structure rests on 4″ or 6″ height , which are standard heights. 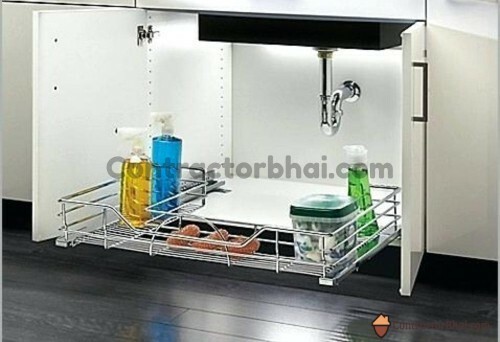 If you have short woman in house who is going to be spending more time in kitchen then u may choose the structure with 4″ leg height or else 6″ is always an option. While in Semi-Modular Kitchen (work done by civil professionals), you will see a bedding i.e a raised floor which not more then 1.5″ to 2″ in height. Because of this bedding, water will not come in contact with the wooden doors or shutters while n you wash the floor. My kitchen has L shaped. It is 10′ straight, 2′ cut for washing shrink and 2′.5″ width. I want to make modular kitchen. please suggest about material, design and cabinet concept. make sure ply is Marine ply. Stell trolleys are of 304 grade steel. Laminate is machine pressed. Choose good quality Hettich or Hafele hardware. Avoid spending extra money items like ‘Magic Corner’. if budget allows go for Edge bending & couple of aluminum profile shutters . how can i confirm that below the machine pressed Laminate, marine ply is there or ordinary ply. unfortunately, once you apply laminate or apply some finishing material there is no way to find out inner material. I know an Architect, who once destroyed one shutter to find out if manufacturer was speaking truth. Carpentry/furniture work is one such are where there humongous opportunities to lie & cheat. If you find something too good to be true, for sure some material is compromised. 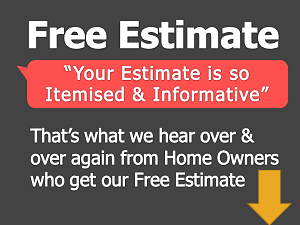 Home Owners liek contractors who under quote or negotiate rates, in turn get cheated. this is vamsi.my kitchen L-shape +parallel type semi modular.I am at present in Delhi and buying a fllat in hyd.what is best ply for shutters,best brand for acc.Is it better to get it done frm local carpenters with material transported frm delhi or transport the custom made kitchen frm delhi or get the kitchen frm godrez or sme other brands.pl advise. Irrespective of where you get it done, Marine ply for shutters is must. Kitchen & Bathrooms are 2 areas inside house where you have to use Marin ply. Do you have any idea about Electro plated materials to use for kitchen cabinets instead of marine play? How good that will be in terms of durability, style and cost. I have no idea what kind of materials they are using to get plated. but its some metals for sure. Please suggest. Hi Nitin, This is Harish from Patna, Bihar. I have a small kitchen of size 8.5′ x 6.5′ having L shape concrete slab 8.5′ X 2′ and 6.5′ x 2′ i.e with sink at one corner of 6.5′ x 2′ slab. The slab height is 32” from floor level. The floor level under L shape slab is 0.5′ higher than rest floor level of the kitchen. I want to install modular kitchen, in it. Please advise me about the best brand of modular kitchen manufacturer or should I get it manufacturer by local carpenter. Also please advise about various types & quality of materials to be used for modular kitchen. What is your opinion about stainless steel modular kitchen and its cost compared to normal kitchen material made with boards. You have both options open – get it from branded company or hire a local kitchen hardware shop. Baiscs are very simple & clear. Only thing which your carpenter will do differently is lamination of shutters. Carpenter will do it manually like old fashion. If you can get Machine Pressed laminate on shutters they will give way better finish. Regarding Stainless steel Kitchen – it is new trend in market. Most Indians wait for people to try things. It is common in commercial kitchens not in residence. Highly durable, easy to clean, will make noise all the time & super costly. Looks Excellent but again its completely new thing – it may look good to you for few months but not in long run. Can you please email/call me – I want to know more about stainless steel kitchen. Hi, I m Ar. Vinaya from Pune. Our kitchen is 8’6″x8’6″ having 14′ running length including 2′ sink length. As I m an architect, I wanna design it as per my requirement & I will execute it with our known carpenters. I m just confused about material costing. Please suggest me some good , durable & cost effective material for the same. Does material play imp role in costing? There is a trick. the holes which get screwed inside shutter, you have opportunity to check ply quality. But again, a home owner cannot make out , you need some other professional to verify it. What is best material for kitchen ?and how can it life? I hv vry small kitchen. Counter top is of granite. But it’s on the concrete slap. And down d counter thr r no shelfs means no wooden work is done in d kitchen . Now we r planning to make d cabinets under d counterpoint.So some of our carpenters are suggesting that we shld break all d granite and make it complete modular kitchen. can u suggest me that is it necessary to break d countertop for modular kitchen. And wht wl be d drawbacks if we do d ply work under d concrete slab. Is it moisture wl be thr always or a cockroaches wl come or any other problem. And wht is good for shutter ply mdf or hdf or normal ply. Is it we shld use mica on ply or paint or Polish. 1) Many a times it is suggested to break exisiting platform so that new design easiy takes up standard size trolleys. 2) USE MARINE PLYWOOD ONLY. Yes use good quality marine ply, there will be no issue of moisture. 4) Fully modular means, that even granite countertop can be removed (dismantled) in future. Even platform base could be dismantled without doing much damage. So what yoru contractor is suggesting is not fully modular & it sounds alright. Most (99%) Indian kitchens are made using Granite & Marble structure. Then Hardware/trolleys are fitted inside. Shutters are made out of plywood ( marine recommended). And many a times, it is ok to use marine plywood for internal partition as well. What is the difference between BWR AND BWP plywood,? What is the block board? Which brand hardwares are good for modular kitchen. block boards are used from framing – example bed framing. Which plywood is good for shutters,tv unit pooja unit & wall unit? Other than hettich which brand is good? inside kitchen & bathroom strictly go with marine plywood. Every other room can use commercial plywood. I am from Pune and getting some kitchen cabinets done. I have visited a couple of vendors as well. For the shutters/cabinet doors exterior coating – i am confused. There are so many materials – laminated, PU , PVC Membrane – matt/gloss, Acrylic, Glass back painted. (Aluminium Profiles which i believe is the border – is combined with these). Today i saw a Glass which has been pasted /pressed on the wood (It has no borders which are seen with usual aluminium profiles). The vendor i spoke to told me that in terms of longevity – laminate is the best. My Q – Which one is preferable for Indian Kitchens ? What is the difference between Marine ply and Boiling water proof plywood. which is the best for shutters. Boiling Water proof is excellent add on to commercial ply or rather a plywood that is not marine. Highly recommended if your budget allows it. However for Bathroom & Kitchen strictly go for Marine ply. EVen if Marine ply is from not so popular brand, stick to marine ply for these two areas. I am from delhi and getting some kitchen cabinets done. I have visited a couple of vendors as well. Hi Nitin, I am looking to get a modular kitchen done in palava city apartment. Do you know any trustworthy vendor who can do the work. Thanks! Hi – Can you tell me which one might cost more – I need to build some kitchen cabinets and am considering either Aluminium frame profile with frosted glass shutter or regular laminate shutters with good quality BWR ply (or whatever is usually used in the kitchen – my interior decorator will take care of that). 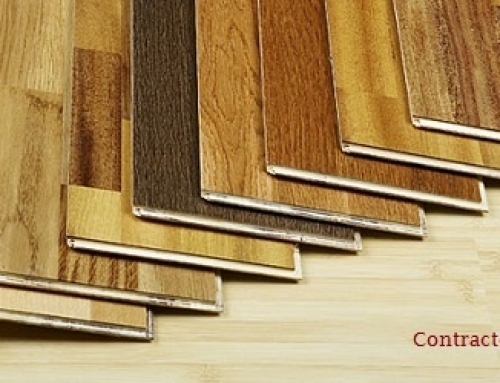 There are several factors like choice of laminate, hardware selection that can increase or decrease price drastically. In general Aluminum profile with frosted glass will come out to be bit costlier then other one. Ofcourse are assuming good quality durable material. At my house, I have mix of both, laminated shutters, as well frosted ones. You can make beautiful designs mixing both of them. Profile with glass gives industrial modern look, but too much of it, will not make kitchen look good. See if your designer can have best of both. Hi… Can u please advice what are advantage using Acrylic over laminates. Do u give services in Navi Mumbai. I have visited couple of kitchen manufacturers and like the look of acrylic over laminates. Please advice advantages or disadvantages of both the material.I am also interested in whole house interiors. Sir, I am not sure if I have understood your question correctly. Laminate ( Decorative laminate ) is better option inside kitchen compared to any other Polish options over wood/veneer. I am not sure if you can do PU Polish or Lamination Polish directly on wood surface, it is commonly done on Veneer. Secondly, MDF should be avoided at any cost inside Kitchen. I am from Indore, MP wanted to know that if we want to make modular kitchen then the granite platform should be made on the concrete base or any other thing such as frames as somebody told me that instead of placing granite on concrete place it on the frame so that when u want to make modular kitchen it can be easily made. Kitchen platforms are made using Granite & Marble frame. Use of concrete/RCC is no longer in fashion. This is valid irrespective of whether you make semi-modular kitchen or not. Can one have marine ply(as cabinet shutter, kitchen trolley shutter) with machine press laminates that is with slight circular corners? I want to use G profile handles. It corners are too circular then difficult to use G profile handles. I have a 10.9 x 8 feet parallel kitchen with 2 platforms provided by the builder,now i want to make it as semi modular kitchen involving 8 trolleys and 10 overhead boxes,can you please tell me the cost if i go for marine ply and also if i chose acrylic. Shilpa madam, which city are you based? Thanks for providing such valuable information. I am making an open kitchen connected to the LR, therefore, aesthetic is kind of important. I’m thinking of going with Marine/Green/Century, SS 304, and Hettich. I would prefer to make a skirting base 3-4″ as a frame. 1. Can you kindly suggest what material to use for the skirting? Can I use Marine or you can suggest something else? 2. How to find a vendor who can do machine pressed lamination or acrylic for the shutters in Kol? You have to find a Kitchen designer or contractor who does complete job. He/she will take care of all items including laminate pressing. Not advisable to hire/buy services for individual items within modular kitchen. For base, create a Marble/Granite platform base. THis will take care of skirting requirement. i HAVE BUILDER GIVEN NICE 6 fts GRANITE PLATFORM PLACED ON MARBLE SLAB UNDERNEATH. And below that kitchen platform I have three marble slab standing making three nice spacious partitions . Now I want to use Hetitch drawer system in each partition but I want to know how can I start. do I ned to make separately again cabinet carcasses to place in these readymade partitions? or I can directly put fittings of drawers on these marble slab standings ? plz reply where to start from. Please hire an experienced Kitchen service provider. Most of the time, wooden verticals are fitted before you fix hardware. hi..what is the differance between ss 202 & ss304..& how to identyfiy the trolly is ss304 or not? 304 is superior. If you have a 20-30 year old steel plate or glass at home, and it has not rusted yet, it had good quality steel. Same applies for trolleys. Unfortunately it is very difficult to know exact grade/quality. Buy things from trusted/reputed vendors. I have a parallel kitchen and have checked with Godrej Interio and a reputed kitchen showroom of our area. The Godrej interio is slightly expensive that than the other one. Godrej interio is steel internals with marine ply shutters while the other one is claiming to give full marine ply. The finishing of Godrej is not so good as the other one’s display kicthen. 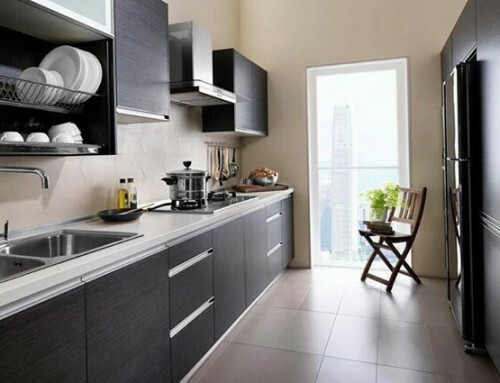 I am also not so sure about steel cupboards in the long run.What is your suggestion and feedback? Also is skirting necessary .Can we have the cabinet standing on small legs or may be make the last one on wheels to take it out completely? Hi, we are planning to go in for modular kitchen. We have checked with local modular kitchen stores and most of them suggest we go with marine ply laminated with sanmaika (three d deisgn )or acrylic. Sanmika range is from 700 per sq mt while acrylic is 900per sq mt. Kindly suggest which is the best one. Does acrylic one break or scratch…what would be approximate cost. I am Unable to comment on price because it varies drastically with quality. Both options are good one. Acrylic glossy look increases aesthetics & in Laminates you have 100s of varities. Just make sure good quality material gets used. Does acrylic laminated modular kitchen break or are there any cracks with regular usage. But for partition what v should use white marble or black kota stone..
As v have consulted 2 modular kitchen maker one suggested black kota stone as marble stone is weak & will not be good for trolleys fitting in long run.. The other one suggested marble & said that is also good as black kota is not smooth & doesnt look good from inside..
You kindly suggest me which will be best out of both..
Will be very thankful to you for ur advice..
Its urgent as v r starting our work within 2 days..
Marble is preferred. It allows drilling & hardware fixing more efficiently. However for some reason if you used Kota, even kota will do the job. Thanks very much Mr. Nitin for your prompt reply..
Hi Sir I have already kitchen constructed with granite just want to create trolly. For this there is frame where the channels get mount. I have received three quotes 1) ss square rod frame. 2) Aluminum square with teak wood inside it. 3) laminated wood partition. Could you please suggest which is strong from above three because I find lot of difference between this 3.
sir, common practice is to have verticals in marble or some other natural stones. Wood partitions are second most common options. I really cannot comment on ss rods & aluminum sqaure. Since these are metal frames it must be quite rigid, however we have not seen many projects with such option. I want to clear a confusion. 1) If i buy some acrylic shutters or PU shutters , are they available in market as per my dimensions? or they are in standard sizes?. 2) If they are cut, edge banding will need to be done separately myself? if I do edge banding then will I get band of acrylic or PU in market? 3) Also, If I buy PU, or Acrylic shutters, then body of the cabinet also need to be of same material as like the shutters. Then How do I do that? These are custom made using high tech machines. Your kitchen designer or contractor gives exact dimensions to factory & then plywood & laminate & edge banding are machine pressed. Kitchen countertop is always Granite or similar material. Water should never drip in to cabinets. I want some information regarding water proof kitchen and room wardrobes, How can I know the carpenter is using waterproof material in my kitchen, becoz m not satisfied his work,which type material is used in waterproof kitchen? Finishing of wooden work is there important to polished mica or not?? What is the acrylic material then?it is marine ply only? Either option will require some sought of minor maintenance after every year or two. Carcass boxes are widely used solution, aluminum skeleton is not very common. I am unable to suggest if certain solution is superior. At my house civil work is going on in my kitchen.. I want to make modular kitchen.. I have instructed my contractor to give me 4 inch marble base.. I want to know wether I use marble for partions or use PVC cabinets..
RIshi ji, it is good idea to keep stone base at the bottom of the kitchen. This allows easy cleaning, and avoids unnecessary water contact with cabinets. 4 inches is bit extra. 2 inches of base skirting is good enough for the purpose. I am from Bangalore. Constructing a new house. Interested in moduler kitchen. I want granite top with partitions made of sandwich panel of granite or marble. I have contacted many interior designers. They say give us the kitchen without any thing in it. But my concern is if water logs in to these wooden partitions it may spoil it. One of the interior designer said we will break every thing which is available and then create a new one as the sizes may not suite. Kindly suggest me in this regard whether to go ahead with granite countertop and marble or stone partitions or follow interior designers advise of wooden partitions. Countertop has to be Granite top. In no case water comes down from countertop. If water travels down from countertop, it means Kitchen/countertop work is not done correctly. WATER NEVER REACHES BELOW TOP AREA. Once countertop is done, partitions can be in any marble or plywood depending upon requirements. In most case main partitions(some of the partitions) are in Marble, some additional ones are in Ply. Outermost verticals and depending upon length of Kitchen, some of the middle partitions has to be Marble. 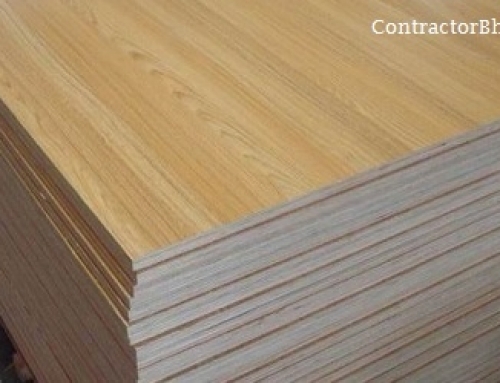 Plywood verticals in addition are used for fixing basket/trolleys/etc. what size of bars are used to make kitchen trolleys and what size of hinges are used in it ? instead of size of bars, I would try verify steel quality(grade). Also try to press in center or some area of trolley and get feel about how easy it is to press/bend it. Little bit of bending is ok, but it shouldnt be too much. Infact purer the steel grade more flexible trolley will be. Hinges are used as per weight capacity required. In every hinge you can decide to upgrade to soft close is budget allows. How good is pvc modular kitchen? still not commonly used, so no one really knows long term results. What do you think about modular kitchen cabinets made of steel? Is it better than marine ply? I am looking for a modular kitchen where there will be no fungus formation and no cockroaches! steel cabinets will make lot of noise. Steel kitchens are popular amongst commercial kitchen, not in residence. I want to redo my kitchen , what do you think about steel cabinet in comparison with marine ply. I want to make a cockroach free kitchen.